Amber Sweeney is one of those artists who began her career by singing in church. She released a solo album at the age of 18 and then spent four years, 2001-2005, as the bass player and background vocalist for the band Enation. She has now released her third solo album, The Starting Line, which features five new original compositions. She has a gritty voce and has developed into an adept guitarist. She also has the ability to write a good tune and is able to add some melodic textures to the mix. It all comes down to a listenable pop/blues fusion album. She has added a little edge to her music as “Leap” was written for the purpose of ending human trafficking. The lyrics show a growing maturity as an artist. 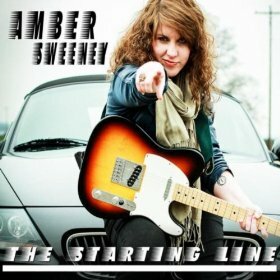 The Starting Line is a nice leap forward as an artist for Amber Sweeney. The main problem is it only contains five tracks. Still, it is worth a listen from an artist that continues to develop.